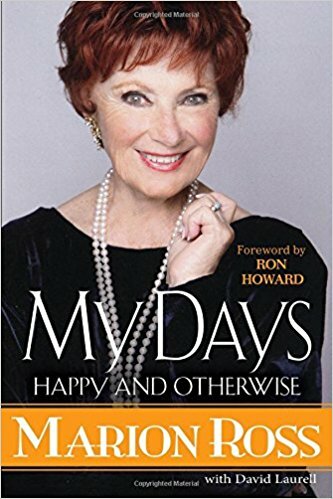 MARION ROSS- MY DAYS, HAPPY AND OTHERWISE- Who doesn’t remember HAPPY DAYS, the iconic show from the 70’s that launched HUGE careers for Henry Winkler, otherwise known as THE FONZ, and ron howard, one of the most wonderful and popular directors out there today. But it also was an iconic role for MARION ROSS, whose depiction of MRS. C was one of the most vivid of the whole show. As the years went by her character became more and more of a wonderful and popular part of the show. She wasn’t just giving the same old lines week by week, she was creating someone special, someone who we all wish we had as a mother. This is one of the most candid and personal autobiographies out there. Isn’t that why we love to read them? She is so easy to interview, and that voice brings back so many memories, and HAPPY DAYS is still show on ME TV today. As you hear her talk, you will realize what a sweet and wonderful woman she is, AND is still very vital today, traveling for the book at an age that will astound you. And hear about her costars, who are interviewed in this book. Really an enjoyable time, and don’t you get the sense she is still a strong woman? And some of the most beautiful pictures of her going back to the 1950s. Find out what it is like to struggle in hollywood. But dream she did, and look what happened as a result! Enjoy the book, and enjoy this wonderful interview with a larger than life actress who brought MRS. C to life.